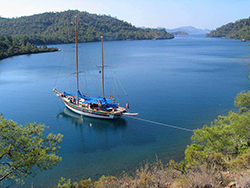 Our sailing routes generally start and end in the harbours of Bodrum, Marmaris, Göcek and Fethiye but we are not restricted to these harbours. You may also choose to start and end your cruise in different harbours. There are many diffferent routes to choose from for your 'blue cruise' from the traditional to the diverse. We are happy to tailormake your sailing route, or you can choose from some of the Arya sample sailing routes, if you do not find what you are looking for please feel free to use these samples as a guide for planning your own personalized itinerary. 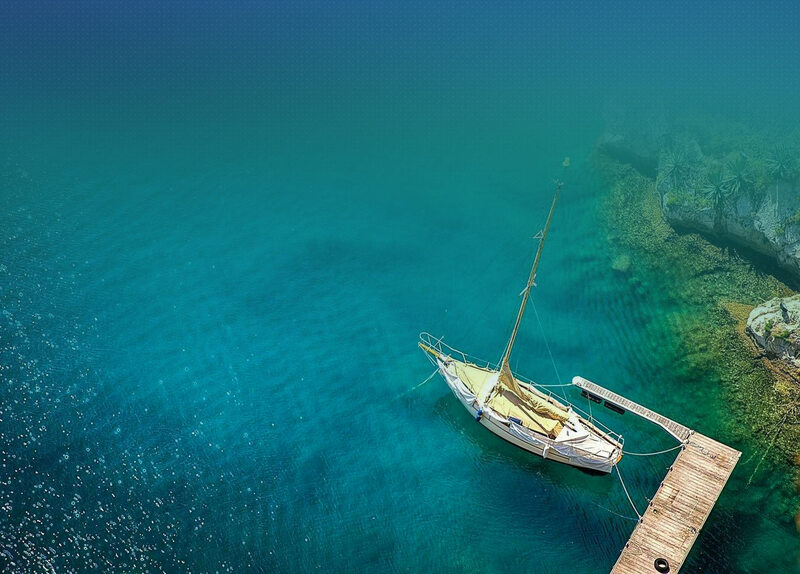 With a private gulet, it’s the beauty of having the options, the choice is always yours as the itinerary on your gulet is flexible, if you discover an anchorage that you particularly love, then you can spend extra time there!! 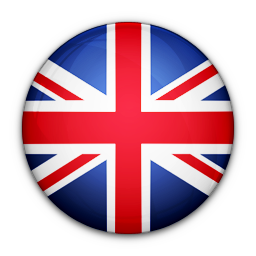 The itineraries that we have designed are to ensure maximum guest comfort and relaxation, whilst providing plenty of interest at a variety of stops. It is necessary that these itineraries remain a little flexible so as to allow for sudden weather conditions and crowds at certain times of the year. 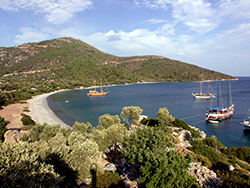 Our cabin charter gulet tours, are restricted to the Greek Island sailing routes, departing from Bodrum on Saturdays. Arrival - Flight to Bodrum and transfer to our Gulet-Yacht in the harbor. Welcome drink and information about the yacht and the tour program. Depending on arrival time and your preferences overnight in the harbour and discover this wonderful town in the evening or dinner and overnight in a bay nearby. 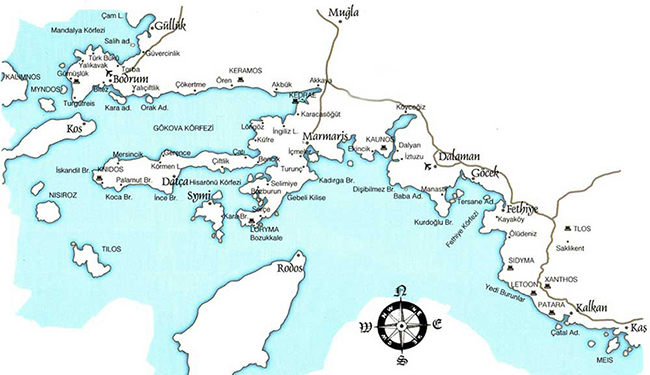 12 Km, Gerenkuyu - Our first bike ride takes us to the Gerenkuyu Bay, where we will have lunch on board. Afterwards we will cross the Gökova Bay. The picturesque landscapes provide unique photographic opportunities. After approx. 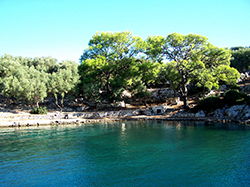 2 hours sailing, we will arrive the ancient harbour of Knidos. Time for a refreshing swimming break. Dinner and overnight here or in Mersincik depending on wind & weather conditions. 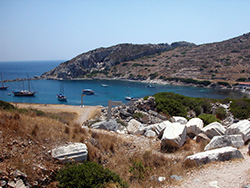 32 Km, Knidos - After breakfast we will visit the ruins of the ancient city ıf Knidos. Today we will ride to Palamutbükü by bike. 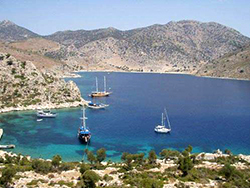 After a swimming break here we will return fromYazıköy to Knidos. 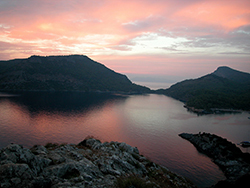 We will spend the night in one of many natural, quiet bays of Gökova Gulf. 22 Km, Datça - We will continue our trip by boat to Körmen. 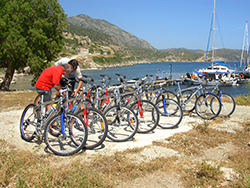 Here we will start our journey by bikes to discover the nice town Datça. In the afternoon, we can make a short hike or a bike ride between Bördübet and Küfre. Dinner and overnight at the bay of Küfre. 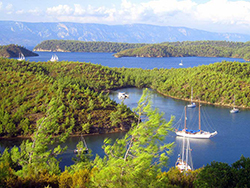 42 Km Karacasöğüt- After breakfast, we will continue our yacht tour along the the picturesque countryside. In Longöz, we will make a swimming break. 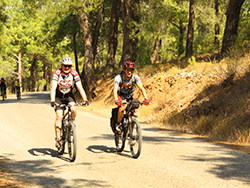 Today's cycling-tour takes us from the "English harbour" through pine forests to Karacasögut. 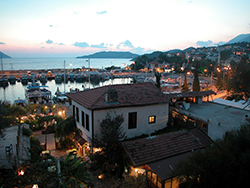 Dinner and overnight in the small villages of Karacasöğüt. 25 Km Ören - After crossing back the Gökova Gulf (approx. 1 1/2 hours), we will reach Ören (Keramos). We will cycle through small, romantic fishing villages, via the ancient city Keramos, until Çökertme and enjoy the nice landscape, on the left side the sea, on the right side the mountains. Dinner and overnight in Çökertme-Bay. 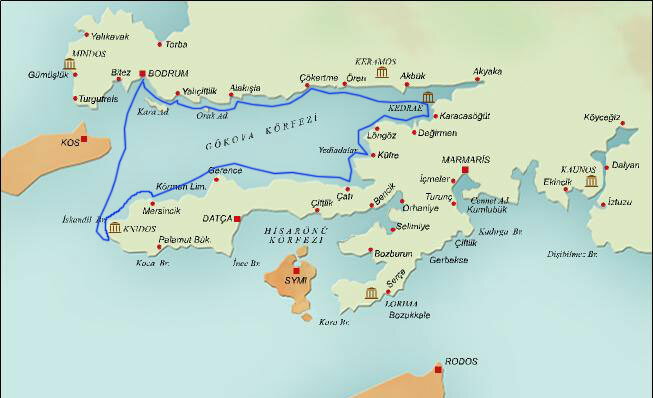 30 Km Hill-Route - Our boat will bring us to the Kisebükü Bay. Today’s lap takes us through pine forests to the small villages Etrim off the coast. We will discovery today the turkish tradition and lifestyle at this typical village. It is possible to visit a mosque there. We will have a picnic in a Turkish cafehouse. 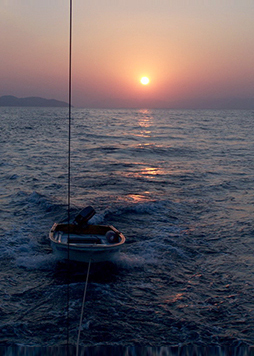 It continues back to Bodrum with our boat, where we can enjoy the famous nightlife after the "Captain's dinner". “Güle güle” - Transfer to the airport and flight back to home. Arrival in Cos around noon. 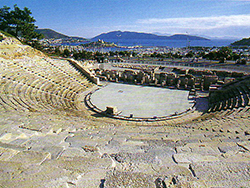 Opportunity to see Asclepeion, Castle or the Museum after lunch on board. Choice of swimming in the warm waters of Empros thermal baths on the south coast. Overnight stay in Cos harbor. Arrival at Leros around noon. After a swim at Xirokambos, arrival in Lakki or Ayia Marina. 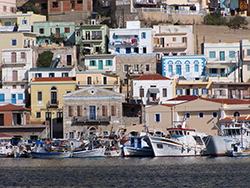 Because Leros is not a ‘’tourist paradise’’, the island has been able to preserve much of its traditional way of life. 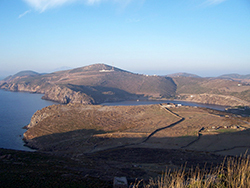 Afternoon and evening open for excursions on foot or by rented motorbike.Overnight in Leros. Early morning departure. Breakfast and swimming opportunity at Lipsi. Arrival at Arki, a tranquil region untouched by mass tourism. Arrival in Scala harbour of Patmos, situated at the base of a mountain crowned by a 13th century monastery of St. John the Divine. The island with its monasteries is of great importance for the Greek Orthodox Church; its many lovely coves and characteristic villages are similar to those found on other Greek Aegean islands. 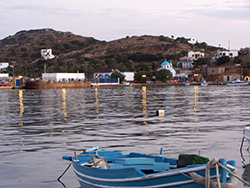 Overnight in Patmos. 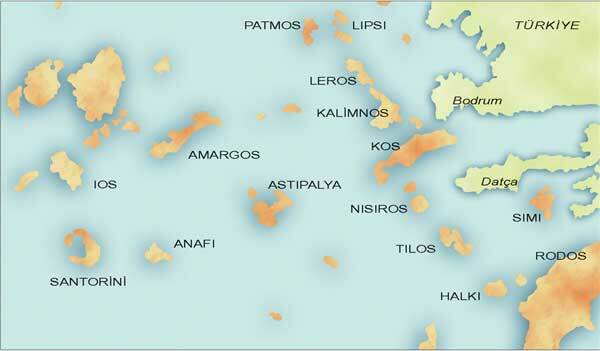 Today’s destination is the island of Kalymnos. 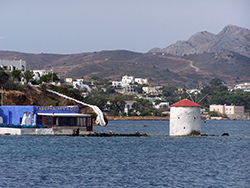 Although its days in the sun as a major sponge fishing center are over, Kalimnos still bares traces of those times in some of its stately homes dating from that era. Arrival in Cos around noon, after a morning swim in Pserimos with departure timed to avoid the rush of daily tour boats. Opportunity to sightsee places missed at the beginning of the cruise. 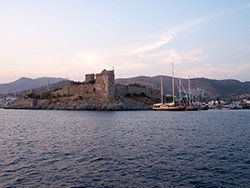 Overnight stay in Bodrum harbor or in a nearby bay. Disembarkation after breakfast in Bodrum. Arrival on the volcanic island of Nisiros. 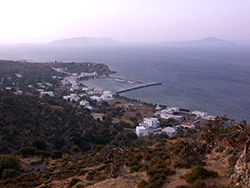 After a sightseeing in town and/or visit by rented vehicle in the vicinity of the crater departure to the island Tilos. Dinner and overnight on board in the harbour or in another silent bay. Early morning departure for Rhodes, with a possible break for swimming on the island of Tilos and arrival in Rhodes around noon. 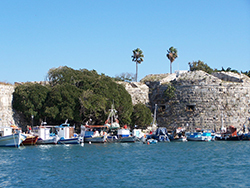 The walls of the medieval Crusader castle of the Knights of St. John are visible from the harbour. Time after lunch to visit the walled old town with its numerous shops and streets dating to the Crusader era. 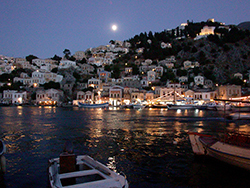 Following dinner on board, opportunity to experience the colorful night life of Rhodes. Overnight stay in Rhodes harbour. 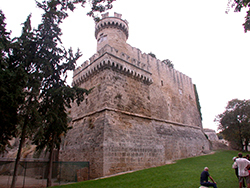 Suggested morning sightseeing, near the harbour, may include the Archaeological Museum and the Palace of the Grand Master of the Knights of St. John. Suggestions for the afternoon include a visit to the colorful village of Lindos and Valley of the Butterflies, both accessible by rented vehicle. 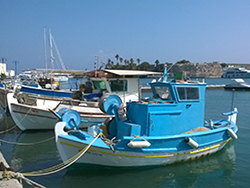 Overnight stay in Rhodes harbour. 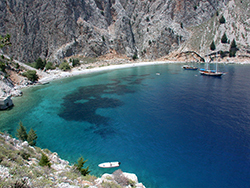 A short sail to Symi, with a break for swimming and lunch prior to entering the harbour. In the afternoon there will be an opportunity for sightseeing along the sea front adorned with 19th century neo-Classical buildings and the interior of the town. Those interested may visit the Panormitis Monastery situated in the south of the island. For those who like walking the island offers pleasant roads and byways. Entering Turkey in Datça after a short sail from Symi, then continuing the cruise to anchor in the ancient harbour of Knidos. After sightseeing the magnificent ruins of the ancient city that surround the harbour departure in the evening for Mersincik cove on the north side of the Datça peninsula for an overnight stay. Embarking the yacht in Fethiye. Information about the yacht and tour program, overnight and dinner in the harbour or near a bay. Departure from Fethiye. 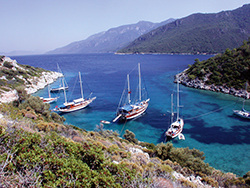 Swimming stops and lunch at the wonderful bays and islands of Göcek like Cleopatra and Hamam Bays. Overnight in one of the bays. Cruising back towards the Gulf of Fethiye. After a cruise of approx. 4 – 4,5 hours we arrive to the Bay of Bestas, after swimming and lunch here you can hike to Kayaköy, a former Greek village, left during the 1923 population exchange between Greece and Turkey. 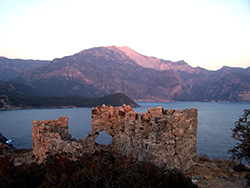 Dinner and overnight at Island Gemiler, with widespread ruins of churches going back to the Byzantine period. You shouldn’t miss the stunning panoramic sunset from the hilltop. Departure after breakfast to Ölüdeniz, the famous “Blue Lagoon”. 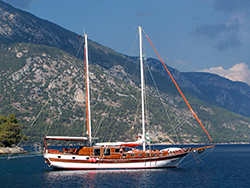 Charter yachts are not allowed to enter the inner side of the bay of Ölüdeniz. But you can take a walk on the beach and in the laguna. After a long swim stop here, we then cruise to Ağalimanı. Dinner and overnight here. Departure to Tersane Island. Swimming stop and lunch here. In the afternoon, cruising to Kızıl and Zeytinli Islands. Dinner and overnight here. Visiting other lovely places in the Gulf like Sarsala, Soralıbükü and Göcek island. 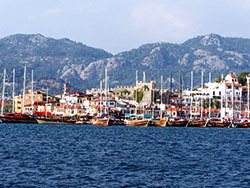 Late in the afternoon we arrive in the in Fethiye or in the bay of Sahinburnu for the last dinner and overnight. Short cruise to Fethiye harbor and disembarking after breakfast. 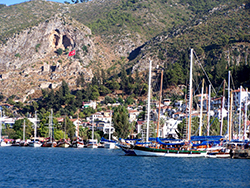 Embarking the yacht in Marmaris, information about the yacht and the tour program. Depending on arrival time dinner and overnight in the harbour or after cruising about 30 minutes arriving at Cennet Island. Departure after breakfast. Cruising about 1 hour to Kadırga. First swim stop here. Cruising to Bozukkale (ancient name=Loryma). Although the turkish name means “ruined castle”, the castle on a hill at the entrance to the port is in relatively good condition. Cruising to the bay of Yesilova. Swimming and lunch breaks in the neighborhood. Dinner and overnight in Bozburun. 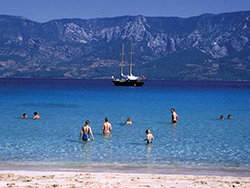 After breakfast swimming stops in the bays of Bencik and Aktur ahaed to Datça. As this is the biggest town in this region, opportunity to have a walk in the city. Dinner and overnight here. Departure after breakfast, swimming and lunch breaks at Islands of Dislice, Kameriye and Çiftlik. Dinner and overnight near a bay. Today we cruise in the region of Orhaniye and Selimiye. Overnight in one of the bays or villages around. 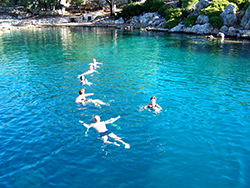 We recommed you to make an excursion from Selimiye to the waterfall of the village Turgut. We cruise today towards Serçe Limanı. A Byzanthian wrech from the 11th century, carrying merchandise to the eastern Mediterranean was founded here. The artifacts taken from the wreck can now be seen in the Underwater-Archeology Museum - Bodrum. Overnight and dinner in Kadırga or Kumlubük. Disembarking in Marmaris after breakfast. Embarking the yacht in Göcek, welcome drink and information about the yacht and the tour program. Depending on arrival time overnight in a near bay after 30 minutes of cruising or in the port of Göcek and discover this wonderful small town in the evening. Early departure to Ölüdeniz. You can take a walk on the beach and in the laguna. 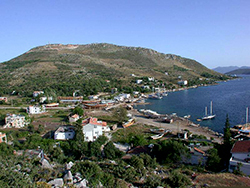 After lunch and swim here we will cruise to the Bay of Bestas, hiking to Kayaköy, a former Greek village, left in 1923. 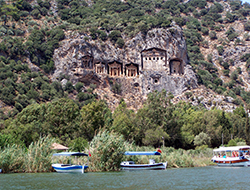 Our yacht will wait for us in Island Gemiler, with widespread ruins of churches going back to the Byzantine period. You shouldn’t miss the stunning panoramic sunset from the hilltop. Early departure and after a cruise of app. 4 hours arriving at Kalkan. Visits with a minibus to the ancient Xantos and Patara. Overnight in Kalkan to discover this picturesque town or in a nearby bay to relax and swim. After breakfast cruising to Kekova the “Sunken City”. The water is especially clear here and you can see the ruins almost the whole length of Kekova island. 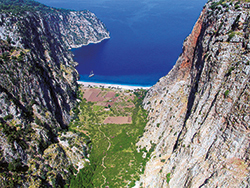 In the afternoon we will hike in the region of Kaleköy (Simena) and Üçagiz (Theimiussa). Overnight in Gökkaya Bay. A short cruise to Demre (Kale), the modern settlement at the place of the ancient city of Myra. In Demre we will visit the church of St. Nicholas, who was the Bishop of the city in the 4th century. This saint who has gathered to himself a large body of mythology is no other than Santa Claus of the western world. 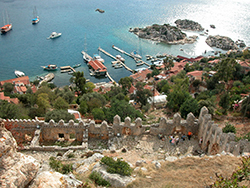 Other highlights of the village are the ancient theatre and the neighbouring Lycian rock tombs. In the afternoon departure to Kaş. Dinner and overnight can be in the harbour to enjoy the night life or in the nearby bay. After breakfast early departure from Kaş to Fethiye. Anchor for some wonderful hiking in the Butterfly Valley, a canyon located at the base of Babadag (Antikragos Mountain) were for thousands of years, its only inhabitants were the butterflies and their local fauna. It is now protected by the World heritage Foundation. 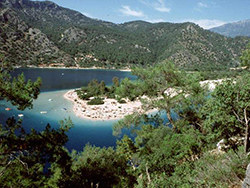 Overnight in a cove near to Fethiye. A day of relaxation on board. Cruising ‘till Ağalimanı behind Kap Kurdoğlu. Swimming and lunch here. In the afternoon one more swim stop in one of the surrounding bays of Göcek. Short hikings to Hamam Bay or to Lydae. Overnight in the harbour of Göcek or in the bay. Disembarking after breakfast in Göcek.